« How to Cook Dried Beans 101: the Healthy, Tasty and Cheap Way to Prepare Beans from Scratch. Going out to eat is not a temptation anymore to stuff ourselves with junk! This alone is a great thing, right? Since I don’t want to trash-talk our otherwise lovely town any further, let me say that I thoroughly enjoyed the opportunity to have AN ENTIRE FULL MENU to pick from at the vegan restaurants in Seattle – something that I kind of forgot how to do since going vegan! It’s funny how changing one thing about ourselves triggers a change in so many other things. 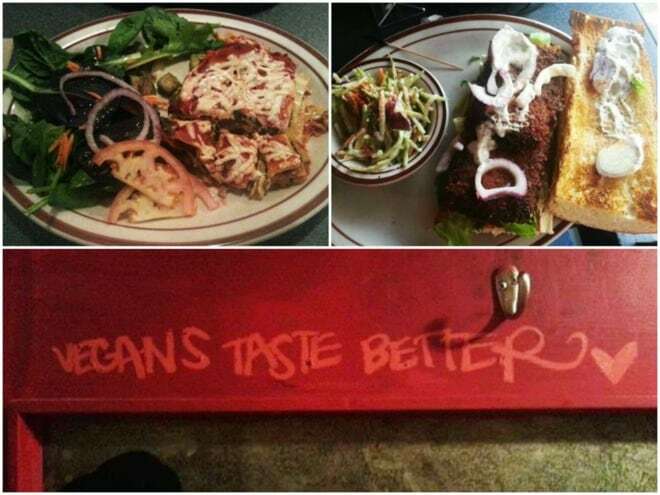 For this review of Seattle vegan restaurants, I picked a few with different ambiance and cuisines. No meal is ever complete without dessert (right? ), so we’ll have a vegan bakery at the end. How we found it: by Googling ‘vegan restaurants in Seattle’ (gotta love having Google at your fingertips!). We walked from Pike Place Market to this restaurant for somewhat over a mile, all uphill! By the time we found it, we were very ready to eat. (Top) The ambiance at Plum Bistro. (Bottom) My smoked tofu open-faced sandwich. Restaurant stats: As it turned out, Plum Bistro is one of the best vegan restaurants in Seattle. The assortment of menu items has that nice chef-like touch to it, the food looks nicely prepared and arranged. If we lived in Seattle area, we would probably come to Plum Bistro for special occasions and nice dinners with an upscale feel. Plum Bistro has a few affiliate eateries: Plum Café, Plum Juice Bar at Seattle Center, Plum Burgers (food truck), and Quickie Too Tacoma. What we didn’t like: The brunch. On Saturdays and Sundays, Plum Bistro serves a smaller brunch menu, thus limiting your options. I understand why restaurants do that, but we wished we had a larger selection to pick from. I had an open-faced smoked tofu sandwich (pic above) that was served with a creamy garlicky sauce, and I wasn’t very thrilled with it: it was too creamy for my recalibrated taste buds, and the smokiness of tofu was a bit too much. The sandwiches weren’t served with any sides (you had to pay full price for side items listed as Sharing Plates). I understand, however, that I just had a wrong item, so if I had a chance to go back, I’d go for lunch during the week, or for dinner on any day. How we found it: also by Googling. My new Seattle friend Jill and I were looking for a vegan-friendly place to have lunch at, and she suggested that we try this place. A couple days later I came back with my husband Rob for dinner. Restaurant stats: Located in Seattle University District, Wayward Vegan Café is one of a large number of vegan- and hipster-friendly eateries with affordable prices where tasty meals are served from 9 am to 9 pm daily. Breakfast, lunch, appetizers and gluten-free food are served all day; dinner is served from 4 pm till 9 pm. Blue Plate breakfast specials are a great deal for those on a budget: from 9 am till noon on weekdays, you can pick 3 items for 6 dollars from a list of such items as Tempeh Bacon, Mexi-Spiced Tofu Scramble, and Garlic Steamed Greens. What we liked: The menu is very extensive (worth checking out on their site!) and has lots of vegan versions of classic American foods. Country Bumpkin! Chicken and Waffles! Salisbury Steak! Wayward Vegan Café is a great place for those who miss the traditional home-cooked food after switching to a vegan diet. Another thing we enjoyed: the atmosphere was more laid-back than in some other, more pretentious restaurants. You order and pay at the register, the food is then brought to you, and after you’re done, you bring your dishes to a dirty dish container (Panera Bread style). One more plus: very affordable! What we didn’t like: On the night we came to have dinner, there was a large amount of tiny little flies in the dining area. Somebody must have forgotten to take out the trash… I ordered the lasagna with a side salad (pic above), and the serving turned out to be kind of small. When I look through the menu now, I see so many other dishes that sound bigger and better… Okay, I’m not holding my personal choice of entrée against the restaurant, I’m just expressing my feelings! Would I come again? Yes, and probably order breakfast for dinner. How we found it: Googling again – see the tendency yet? On one of our first nights in Seattle, we decided to go to an all-vegan restaurant (as opposed to vegan- or at least vegetarian-friendly, which is always the case back home). Araya’s Place popped on the radar, and we were glad that we decided to take a drive and discovered the beautiful neighborhood of Bellevue. We came back to Araya’s one more time before we left Seattle. 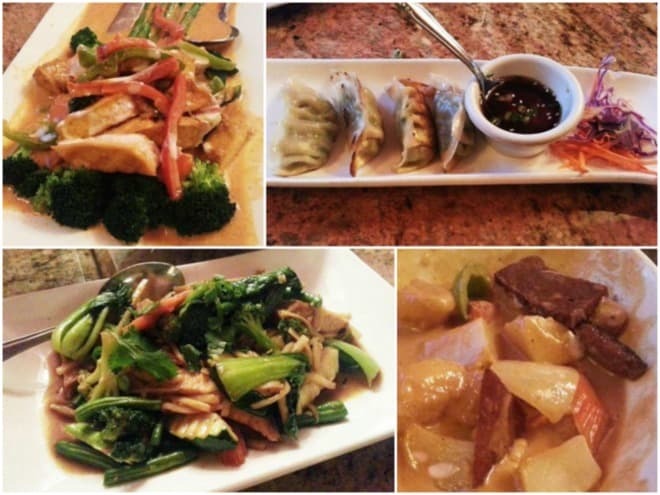 (Clockwise from top left) Asparagus Hunsa; veggie pot stickers; Massaman Banana Curry with Seitan; tofu and vegetables in a garlic-ginger sauce. Restaurant stats: Araya’s Place is an all-vegan Thai restaurant (although their sign says vegetarian). The menu is very extensive, even larger than what you’ll see on their site. Most entrees contain either tofu or seitan. Araya’s has two locations: the one we visited in Bellevue, and another in Seattle’s University district (a stone’s throw from Wayward vegan Café). What we liked: The servings were very large and loaded with veggies! Our leftovers made for a nice lunch the following day. Rob is a big fan of seitan, and it can be hard to find in restaurants unless they are exclusively vegan, like Araya’s. He declared his Massaman Banana Curry with seitan the best dish he’d had in the time we were away from home. What we didn’t like: Menuwise, I’d add more dishes that had neither tofu or seitan. Sometimes you just don’t feel like eating those, you know? Also, Rob found a small piece of plastic wrap in his entrée the second time we had dinner at Araya’s – not a big deal, it’s not like it was a roach or something. The management reacted very nicely and sent us a delicious dessert (see above) on the house! Would we come again? Definitely! 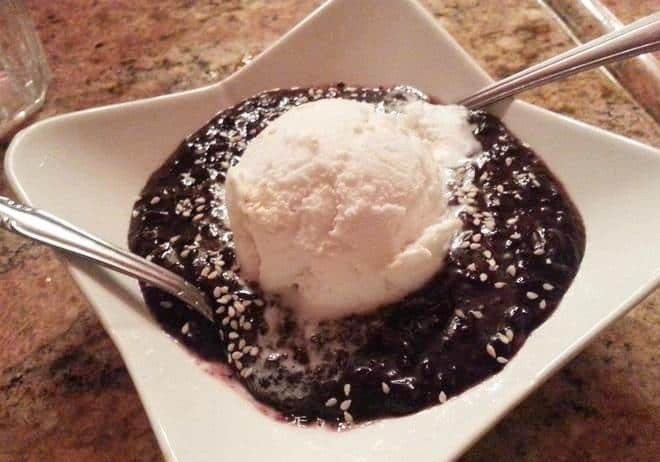 How we found it: A girl named Sarah from one of the Facebook vegan groups I belong to recommended Flying Apron as one of her favorite vegan eateries from when she used to live in Seattle. Since taking cues from locals is a great way to find delicious food, we decided to check it out. Restaurant stats: Flying Apron Bakery and Café does an impressive job of creating gluten-free, all-vegan pastries of all kinds. According to their site, they use “unique flour blends with an emphasis on whole grain flours including quinoa, oat, sorghum, and brown rice.” They aim to create delicious treats that are healthy, decadent, and not at all health-food-y. Other foods like lasagna, pizza and salads are available. 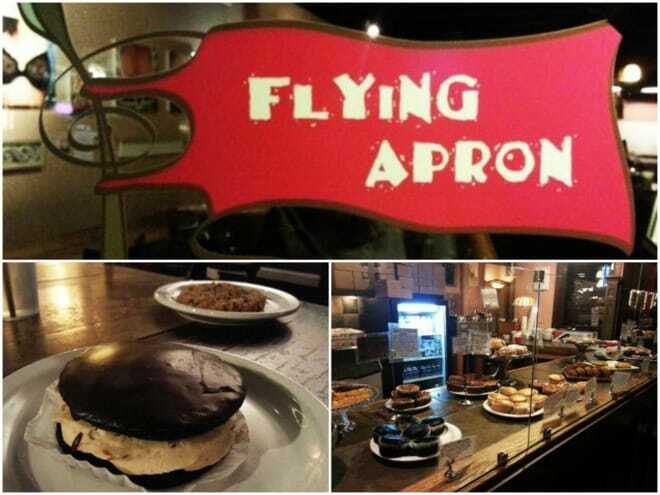 Flying Apron has two locations in Seattle area, and they also provide their baked goods to over 130 restaurants, café, coffee shops, and grocery stores including Whole Foods (you can see a full list on their site). On the night we stopped by their Fremont location, we saw what looked like at least a couple hundred of freshly baked chocolate cupcakes ready to be frosted in their kitchen! What we liked: The variety of desserts was impressive! We arrived later in the night when they already started putting away the items from the showcase, but there were still many options to pick from. I got a chocolate whoopee pie with peanut butter filling and a cup of green tea, and Rob had a peanut butter chip cookie. Both were delicious, but my whoopee pie was out of this world! I used to be a big fan of creamy frosting on cakes, and now that I’m a vegan I’ve embraced the fact that those cakes are mostly the thing of the past (that’s better for my health anyway). Flying Apron’s whoopee pie brought back all of those delicious memories, and then some! Another thing I liked: that I live across the country from Flying Apron, otherwise I’d be going there too much! What we didn’t like: I was so impressed with the filling of my whoopee pie that I asked the staff about the ingredients. The guy at the register showed me a laminated list of ingredients in all of their frostings (they get asked about those a lot), and it turned out that one of the main components in their peanut butter frosting was palm oil. Obviously, if I wanted all of the frostings I ever consumed to be healthy, I should have been born on a different planet, but palm oil is not just unhealthy: its production negatively affects the environment of the Earth because large stretches of tropical forests are cleared every day to grow more palm trees. There is no way I’m going to blame the people behind Flying Apron Bakery for chopping down the Amazon (that’s too long of a stretch! ), but maybe they could find a substitute. Until then, less dessert for all of us! Would we come here again? Definitely. And order other treats besides the whoopee pie. Verdict: we enjoyed the opportunity to dine at various vegan eateries during our trip to Seattle, and most of them provided a good experience. However, nothing is healthier and cheaper than cooking at home, so in a way I’m glad that we don’t have any fully vegan restaurants in our hometown in Southern Alabama! If we’re ever back to Seattle area, I’d definitely stop by these restaurants again. Do you have a favorite vegan restaurant? Where is it located, and what kind of food does it serve? Tagged dining out, restaurant reviews, Seattle, traveling, vegan travel. Bookmark the permalink. I agree with the “too creamy” comment about Plum Bistro. Even though you were just talking about one dish, their food in general is very rich (even at Plum Cafe). 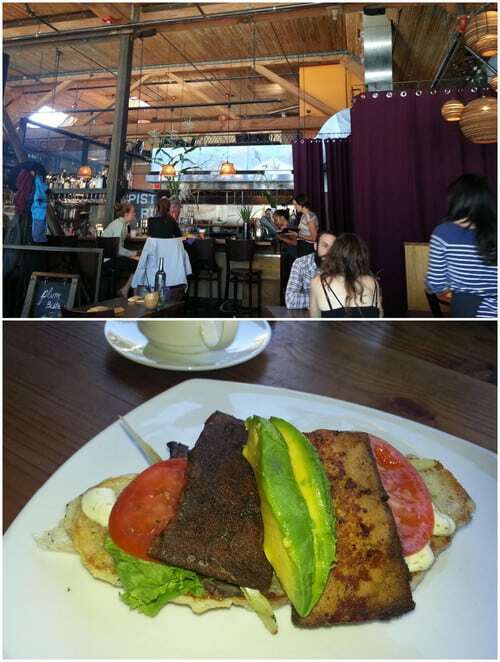 As for my favorite vegan restaurant in Seattle… Cafe Flora in the Madison Park neighborhood. It’s on the fancier side, but the prices aren’t as high as Plum Cafe and you get a side of potatoes with your scramble! They have delicious breakfasts as well as lunch and dinner. Thank you for sharing! I’ve wanted to visit Café Flora for a while, will try to do so in the nearest future.